Baby monitors are an amazing, ultra-specialized case of ‘Consumers ask, the free market provides’. A simple contraption; basically a microphone hooked up to a speaker, the baby monitor nevertheless fulfills an extremely useful function—letting parents rest knowing what their little ones are doing, and around the clock at that. If the battery lasts that long, that is, which brings us to the main problem with baby monitors. Since their inception in the 30s (! ), they have changed. A lot. Nowadays, they feature anything from GPS to built-in screens, two-way mics, speakers, remotely adjustable cameras and more. Since it can and often will be hard to choose a good one out of this ginormous pool, especially if the price is of an additional concern. Thankfully, we’ve assembled this list for you, featuring the best of the best baby monitors, made by one of the most trustworthy brands in the sector, VTech. 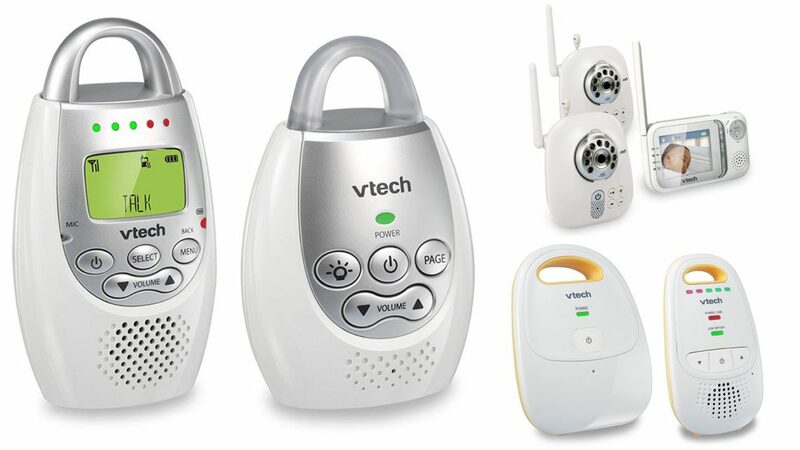 Here are the best baby audio/video monitors from Vtech. The DM221 is VTech’s mid-range unit, designed to fit right into that sweet spot between price and performance. A fairly simple device, it is designed to be easily used, easily carried with you on the move, and used without hassle or lengthy setup. It’s a walkie-talkie at its core, with up to two ‘parent units’ per ‘baby unit’—that means there can be up to two parents or guardians at the other end listening in at any point. However, the DM221 is more than just a mic and a speaker. It features a sound meter, too, which notifies the ‘parent unit’ via a vibration alert when things are getting a little noisy in the nursery. For calming your little one down with a few soothing words, but without having to rush their way, there’s “two-way communication”—both units have microphones and speakers each. With a range of 1,000 feet under optimal conditions, the DM221 can be used without issue throughout the house—even if said house happens to be rather spacious. But it’s the little things, too, that set it apart from the masses. Like the built-in illumination on the baby unit, or DECT 6.0 communication for zero background noise and great clarity. The price, as well, is very buyer-friendly, at just $40; a second parent unit is $10 more. On the other hand, the DM221 is not exactly a high-tech piece of kit, and that’s putting it lightly. It looks like something designed 10, 15 years ago, and we imagine most of it was. The overuse of plastic—the cheap kind—and the relatively low quality of the LCD and speakers are not exactly top selling points. As a mid-range option for those looking for value first and foremost, the DM221 is a great baby monitor. It’s far from perfect, but will serve its purpose well and at a generously low price point. If you feel that this still is not enough, then nothing will be; only truly high-end (read: expensive) baby monitors punch far above and beyond what the DM221 can offer. Speaking of the high end: Here it is. The V321 might not be VTech’s most expensive model of them all, but it certainly occupies a very high spot in the price-performance hierarchy of their model line. What sets this one apart from your average $30 monitor? Well, let’s start with the obvious first: Video capability. The baby units on the VM321—yes, plural; you get two out of the box—feature built-in cameras that transmit live footage of your child to the parent unit. For this purpose, it sports a modern full-color LCD screen, measuring 2.8”. Gone is the grey-and-black monochrome screen from the cheaper models. For use at night, this system supports IR night vision—much less intrusive than a light. Although based on the same DECT 6.0 tech and intercommunication system as the DM221, the VM321 expands the existing feature set by adding additional controls, such as preset soothing lullabies that can be played over the speakers. The cameras, besides the integrated night vision, also offer the option to be wall-mounted. When more than one is active—the system is limited to four at any given time—the LCD screen on the parent unit enters split-screen mode, to let you view everything at a glance without having to press any buttons or navigate menus. They also feature an internal thermometer, so you can remotely measure the room temperature, too. You can even set an audible or vibrating alarm based on temperature fluctuations or sound. Of course, don’t expect to get all this stuff for free; far from it. At $180 and $100 per additional camera, the VM321 system is worth quite a hefty sum. In addition, despite the high-tech features on offer here, we’d have hoped for more in some places—not being able to adjust the camera angle without physically going up to them and moving the lens by hand is a hassle. Even the range and signal quality haven’t been strengthened compared to the cheap DM221 make the VM321 a harder buy, too. 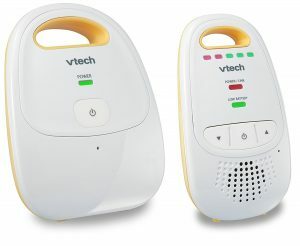 Though it has some seriously head-scratching shortcomings, the VM321 is one of the best baby monitor systems VTech has on offer, and that says something. On value alone, it falls nearly flat, given the lack of a definite performance jump compared to much, much more affordable units. However, if it’s the ultimate in capability and features you desire, this one’s a good bet. On the opposite end of the spectrum, there’s the DM111, a budget option of the extraordinary kind. In an attempt to cram as much as possible into a tiny form factor and $20 price point—yes, you read that correctly—VTech went through insane efforts to make this one the highest-value baby monitor on the market. Featuring no form of input or output besides audio, it is a very basic system. The parent unit includes nothing besides a power button, volume control, and noise meter. 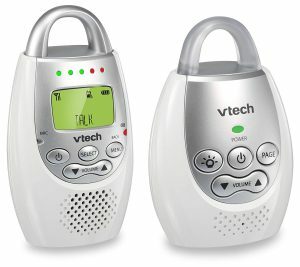 Surprisingly, though, the core, and arguably the most important component of the DM111—the entire communication suite, from the chipset to the speakers and internal microphone—are the same that you will find on VTech’s most expensive models. This makes it a great value proposition, and if you don’t require anything besides basic audio output, then you’re pretty much set to go with the DM111, no extras, accessories or high-end alternatives needed. It should be obvious that such a device can’t and will never be for everyone. Barebones as it is, the feature list is many orders of magnitudes shorter than the list of features we might have liked to see but weren’t actually included. And well-made, it’s not, either. After all, how much in terms of build quality can you expect from a $20 product? As barebones as it is, for budget hunters, the DM111 is indispensable as a baby monitor. No other device offers this satisfying of a price-performance combo, not even VTech’s remaining lineup. So, if the value is what you’re after, the DM111 may just be the king of the hill for you. So, there you have it. For every kind of buyer, there is the perfect product; one just has to know where to look for. Whether you want the best in performance, the most jaw-dropping high-tech wow factor, or simply the best bang for your buck, the market’s got your back. Our top three may not even be ‘your’ top three, in fact—feel free to use this guide as just that, and shop around on your own, now that you’re aware of what differentiates a good baby monitor from a bad one. Good luck!